It was a warm summer afternoon. Christopher Corn was walking along a country road. He was returning home from taking some time to enjoy nature. As he was walking, he saw a young girl and young boy sitting on a rock by the side of the road. “I don’t like vegetables,” said the girl. “I think they are over-rated,” said the girl. “I don’t,” said the girl. Julie was very excited about getting free tickets to see Loud Garden perform. She did eat all her veggies for the week. Christopher gave her the tickets, like he promised. It is a good idea to eat your veggies. Example: Christopher Corn told Julie he would give her tickets to his concert if she ate her veggies. 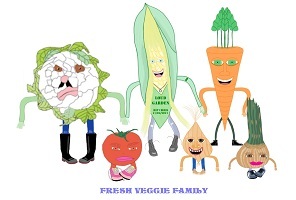 This entry was posted in Fresh Veggie Family Stories, Grade 3 Level, Summer Stories, Summer Story Challenge 2017 and tagged Christopher Corn, concert, Eat Your Veggies, garden, veggies, warm, You Don't Like Veggies?. Bookmark the permalink.